Game Boy Australia: Dot.AY playing in a band! Dot.AY playing in a band! 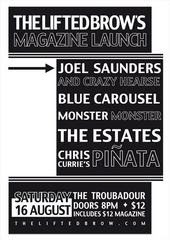 To launch The Lifted Brow magazine's 3rd volume there will be a music show on Saturday 16th of August, at The Troubadour with some of Brisbane's finest indie acts and some chiptunes. The Lifted Brow is an independent journal of letters, arts, and sciences. It's helped establish artists like Joel Saunders, Thomas Benjamin Guerney, Ben Constantine, and Michaela McGuire; and attracted artists like Neil Gaiman, Tao Lin, Anna Krien, and Mgmt. Dot.AY will be performing some of his own songs as well as participating as a member of Joel Saunder's band Crazy Hearse. Joel Saunder's has also recently acquired the fairly new PAL tuned version of Cynthcart, so there will be some fat C64 drones amongst gameboy beeps, live guitar and drums and lots of granular synthesis. Keep an eye out for more Dot.AY Vs. Joel Saunders remixes and collaborations in the near future. In related Dot.AY news if you are in Brisbane this week also head along to Troubadour Friday 15th for the release of Brisbane music compilation Stranded, in which Dot.AY and Joel Saunders both have tracks. Wow! This is awesome news.